Loaded with kit (including eight airbags) and powered by the latest in direct-injection turbodiesel technology, Renault’s new Latitude is set to take the D-segment by storm in developing markets the world over. Moscow’s international motor show opened on Wednesday and Renault used the opportunity to showcase its new Latitude sedan. This D-segment four-door offering is set to compete with the likes of VW’s Jetta and the entry-level rear and all-wheel drive German executive sedans. The Latitude is a joint venture project with Samsung motors in South Korea. Built on the Laguna floorplan, Latitude sports a generous 2.76m wheelbase (it is big inside) within its 4.88m bumper-to-bumper length. Although the styling is hardly avant-garde, it does appear to be a high-value offering – combining space and a surprising level of technical sophistication. The Latitude cabin environment is accessed via a keyless entry card and well equipped too, with the driver’s seat gaining massage functionality and all occupants benefitting from individually tailored three-zone climate control. Infotainment tallies an array of audio solutions, ranging from 3D Arkamys sound to a premium Bose system. Courtesy of the Laguna design influence, Latitude inherits its larger sibling’s Carminat TomTom SatNav system - buoyed by rear-view camera functionality. Seeing that it is a Renault, you would expect the Latitude (in small part due to its front-wheel drive configuration) to trail a torsion beam rear suspension. Torsion beam set-ups work well in small city cars and V8 tin-top racers, yet are a compromise as the design application moves into a more upmarket segment where a premium is put on ride-quality. The torsion beam rear suspension configuration is robust engineering and simple, but hardly sophisticated enough to challenge the likes of those German multi-link rear suspension alternatives. Fortunately the Latitude features all-wheel independent suspension, with the individual rear wheel attachments balanced by a Nissan multi-link mechanism. With each wheel managing its oscillation in isolation ride-quality, agility and high-speed stability should be outstanding. Powering the Latitude will be a multitude of engine and transmission options. Entry level Latitudes get by with a 2l petrol engine (102kW/191Nm) driving the front wheels via a constantly-variable transmission, similar to that found in the current Renault Koleos. Economy minded buyers will find equal capacity compression ignition power, available in two states of tune. The Latitude’s two 2.0 dCi engine’s producing 110kW and 127kW respectively. For drivers who require more power, or cover long distances and endurance-sapping gradients often, there are three V6 engine options - one of which is a diesel. The smallest 2.5l V6 produces 130kW and 233Nm, whilst the 3.5l engine (currently available in the Laguna coupe) is worth 177kW and 330Nm. 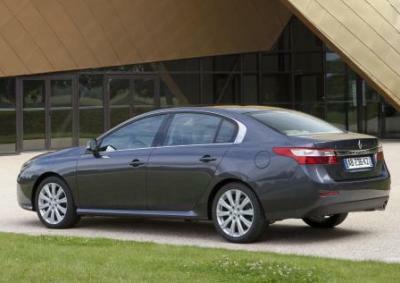 Both these V6s drive the Latitude's front wheels via a six-speed automatic transmission. World's most powerful front-wheel drive car? Buyers who require big outputs and trifling economy will have Renault’s new V6 dCi engine (due for local debut in the Navara bakkie soon, oddly enough) as an option too. Powering up to a similar 177kW output peak as its 3.5l V6 petrol sibling, yet supported by an awesome 550Nm of pulling power, this dCi V6 should make a compelling alternative. Curiously, when the 3l V6 dCi engine is introduced to the Latitude range it will share a title with Audi's entry-level A8 3.0 TDi as the world’s strongest front-wheel drive car. The range topping V6s and diesel engines are only expected to be rolled out a few months after the Latitude comes to market towards the end of September. Due to be assembled at the Busan facility in South Korea, Latitude build quality promises to be impeccable and Renault hopes to export and retail the car in 30 markets including Asia, Africa, Russia, Turkey, Gulf, Australia and Mexico.